List Your Campervan Motorhome for FREE & Earn - You Set The Pricing! List for FREE and You Set Your Own Availability and Pricing! 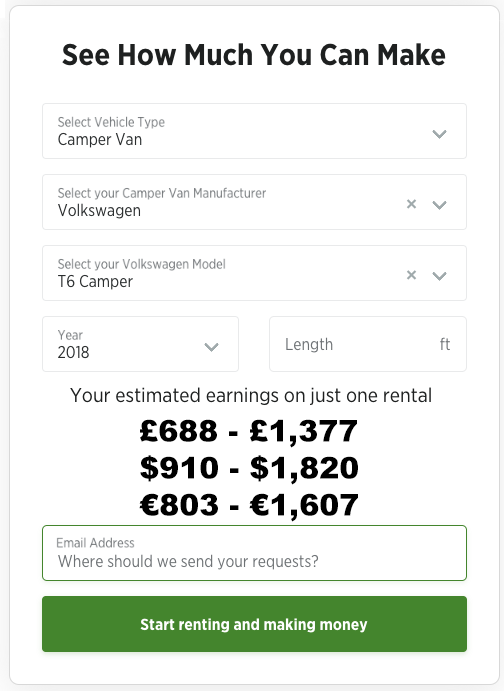 Campervanhire.com has partnered up with Outdoorsy – the world’s largest and most trusted RV rental marketplace – to help you earn great money renting your vehicle when you’re not using it! Outdoorsy is the largest and most trusted RV rental marketplace. Renting your Campervan or Motorhome is made simple and secure with our unique benefits and offerings. Rent your Camper Van or Motorhome with complete peace of mind. $1 million liability insurance policy covers you whenever it’s being rented. You’re also covered for theft and damage subject to our policies. Outdoorsy’s $1 million liability insurance policy covers your RV or trailer whenever it’s being rented. You’re also covered for theft and damage subject to our policies. You’ll arrange to meet with renters on the day of pick up to exchange keys & give them a walkthrough of your RV. It’s FREE to list on Outdoorsy. A small transaction fee is taken from each successful booking.